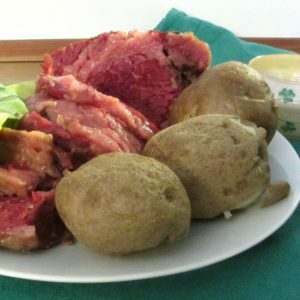 Irish American Corned Beef and Cabbage – a classically American dish, made by immigrants combining familiar technique with available food! The other major influence is those people themselves. Even those fleeing hunger – and certainly those coming for other reasons – wanted that food to taste familiar. We all do, after all – even Americans merely moving to another part of the country often miss the flavors of home – New York bagels, North Carolina barbecue… But that’s just one food – imagine what it is like when nothing tastes like the food you grew up with! It’s hard when you cannot get the right ingredients… Sometimes local markets spring up to solve that problem. Sometimes you can cook or grow the right food – I buy broccoli rabe every Spring from a farmer whose grandfather brought the seeds from Italy and first planted them on a patch of land in the Bronx. And that wonderful assortment of ingredients enriches our cuisine – so that I can casually write a post about cooking pork chops with tamari and shitake mushrooms, knowing that most readers can source them with little difficulty. But often even now – and of course much more a hundred or more years ago – people just couldn’t get the right ingredients. So they improvised, and used the techniques they knew with the food they could get – and that has also given us wonderful food! By the time of the major migration from Ireland in the late 19th and early 20th Centuries, the Potato Famine was over, Ireland had some food security, and most people had been able to, at least sometimes, boil a little meat with their potatoes and greens. Bacon, usually – Irish bacon, not the streaky rashers we eat in the US – cured pork from the loin and back, solid meat with just a streak of fat. As well as being good itself, the cured meat added flavor to the vegetables cooked with it – but what was a cook to do, when none of the stores had anything she recognized as bacon? Well, they did sell corned beef. That existed in Ireland of course – salting and curing is a basic way to preserve meat – but beef was packed for export to England. Most people in Ireland couldn’t afford beef, but ate pork or mutton when they could get meat at all. Here, though, it was something they could buy, and boiled with potatoes it tasted… almost like home… So even the poorest could buy a little corned beef, and raised their children thinking of that as home cooking. 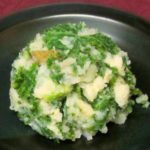 And over time, here, corned beef simmered with potatoes and cabbage (the most readily available green vegetable here – kale was at least as common, back in Ireland) came to be seen as a specifically Irish dinner. 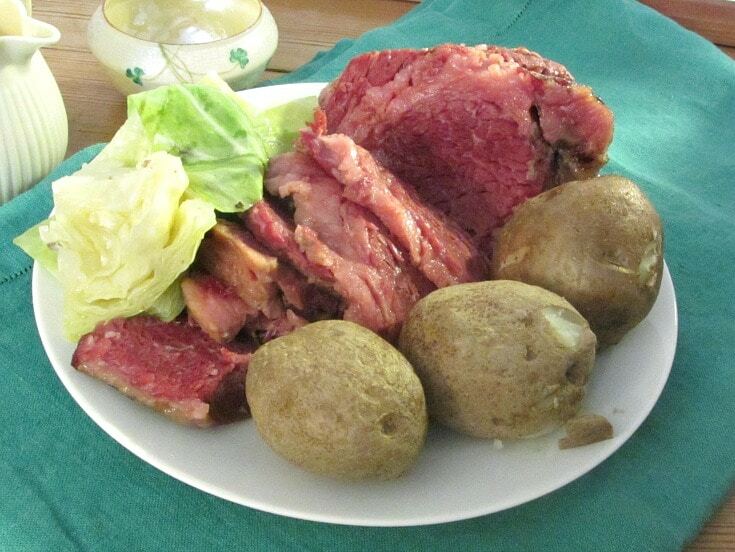 (Despite the fact that the New England Boiled Dinner is identical! 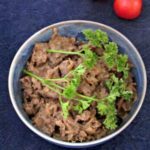 though it may use ham or fresh beef instead of the corned beef.) And gradually, people came to eat it on St. Patrick’s Day, remembering the grandparents and their struggle to build a new life in a new nation while still remembering their own heritage. So – it’s really easy, but it does take time. Brisket is a very tough cut, and requires a long, very low simmer to tenderize it. The corned beef I typically buy in the nearest supermarket comes in a cryovac wrapping, with “Natural Flavors” already added. Most of the flavor comes from the meat itself and the corning process, but it’s pretty easy to see that most of the additional Natural Flavor is whole mustard seed and a little allspice. When I buy it in stores with better meat departments – unwrapped and unseasoned – I may or may not bother to add the spices. It’s good either way. Allow yourself plenty of time. The meat needs to cook at a very low simmer for about 50-55 minutes per pound – less to cook the meat through (though of course it will) than to tenderize it. “Very low” is the operative phrase, here… high heat will toughen, rather than tenderize. 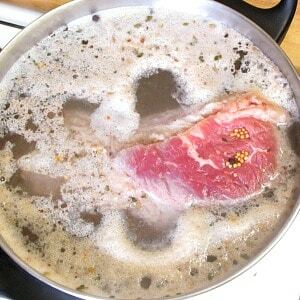 So put your meat in a large pot – big enough to cover it with water. And then, in fact, cover it with water… At the same time that you add some flavor from the spice, you’re also soaking out some of the salt – this is salt preserved meat, after all. The liquid becomes almost a brine, and that, in turn, seasons the potatoes and vegetables. If you want to add spices, do so now. Put the pot over a medium heat, and slowly bring it up just to a rolling simmer. If you cover it (I did) set the lid ajar to allow steam to escape and keep it from actually boiling, let alone boiling over. Did I mention very low heat? Start it in time for the meat to be cooked fifteen to twenty minutes before you want to serve… I turn it over midway through, to be sure it cooks evenly. About twenty minutes before the meat is cooked, it’s time to add potatoes. Here is where you can tell how assimilated I am. Early Irish immigrants abhorred unpeeled potatoes, because eating them “coats and all” was a sign of abject poverty, in the old country. And the attitude was passed down – I have friends who won’t touch a potato skin, even on baked potatoes, because that’s how Grandma reacted. My family has been here long enough, and intermarried enough. I never peel potatoes. Your choice – on this recipe, I have to admit, peeled is more authentic. Cook extra – you’ll thank me when you eat them the next day! Equally, I undercook cabbage by traditional standards. So this is the almost even tricky part – I don’t want the cabbage to simmer long and low, so I don’t add it to the simmering meat. But it’s best to let the meat sit and cool a while in the brine at the end of cooking (rather than resting on a cutting board as a roast would.) So, once the meat is fully cooked and fork tender, I remove the pot from heat, pour off some of the brine into another pot, and cook the cabbage, cut in wedges, in that while the meat rests. Whatever you do, though, do cook the vegetables in the meat brine – the flavor is amazing! And please, don’t limit this dish to mid-March! It’s a wonderful hearty winter meal, and much too good to only eat once a year. 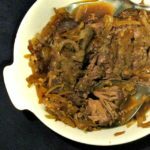 Irish American Corned Beef and Cabbage - a classically American dish, made by immigrants combining familiar technique with available food! 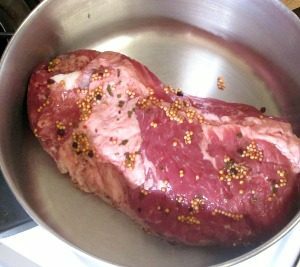 Place corned beef in a deep soup pot, and cover with cold water. Add seasoning, if using (some may come packaged with the meat.) Cover with cold water. Bring water to a slow simmer, and cook on low for 50 minutes per pound. 20 minutes before meat is done, add potatoes. When time is over, and the meat is fork tender, remove from heat. Allow the meat and potatoes to remain in the liquid in the pot. 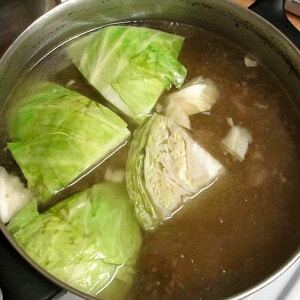 Pour off some of the brine into another pot, bring to a boil, and add the cabbage, cut in wedges. Cook 5 minutes or until done to your taste. Slice the meat across the grain, and serve with potatoes and cabbage. Amounts are loose - this makes more than most families would eat in one meal, but leftovers are wonderful! I've never actually tried this, but I've been seeing this dish everywhere lately! It's very popular in the US for St. Patrick's Day - next Friday - which may be why! It also really is delicious, and deserves to be eaten more than once a year. 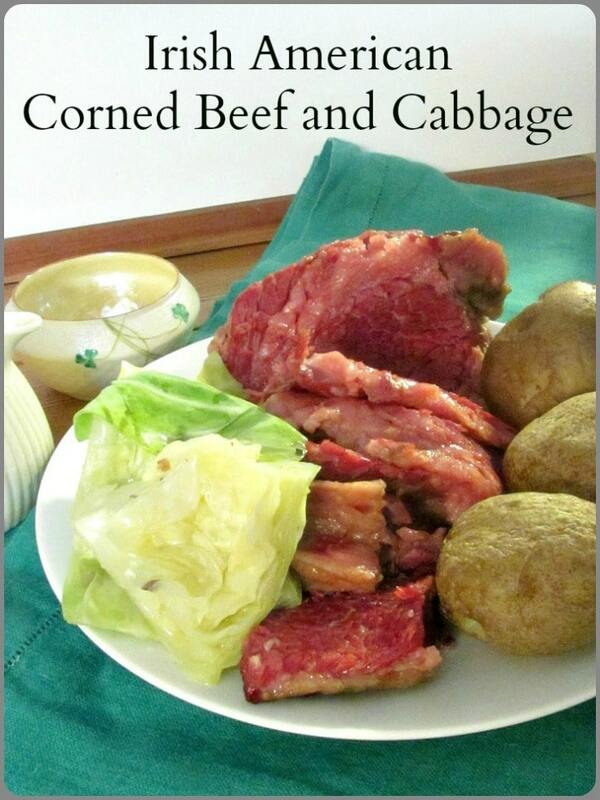 If you can get a nice piece of corned beef, give it a try.